What's the bigger story for New York this morning? The Giants trading Odell Beckham Jr., easily one of the most dynamic wide outs in the league, or the Jets inking Le'Veon Bell, the superstar free agent running back? Sure, in our rubber-necking society in which everyone slows to a crawl to see the wreck, the Giants seem to be the easy choice. After passing on a QB last year and turning the immediate future to a 38-year-old washed Eli Manning, the Giants have now lost their defensive leader (Landon Collins) to free agency and dealt Beckham to Cleveland. Side note: We see what your doing Browns, and we like it. Kudos John Dorsey for moving pieces and draft capital for superstar pieces. Cleveland dealt its first and its third and Jabrill Peppers — the former Michigan safety who was one of the picks acquired in the Deshaun Watson deal — for a true game-changing perimeter talent. Look at how the Browns have overhauled their offense. Baker Mayfield has the look of a franchise guy. Nick Chubb was a dude last year, averaging 5.2 per carry and getting 996 yards despite starting only nine games. Jarvis Landry — who played with Beckham at LSU — now becomes the best No. 2 receiver in the league. Antonio Callaway could be the most explosive No. 3 receiver in the league. And remember Cleveland signed Kareem Hunt too. All of those dudes are 26 or younger, too. And for the folks in the know: Vegas dropped the odds on the Cleveland Browns to win the Super Bowl from 30-to-1 to 14-to-1. Also of note, the Steelers odds went from 14-to-1 to 30-to-1. 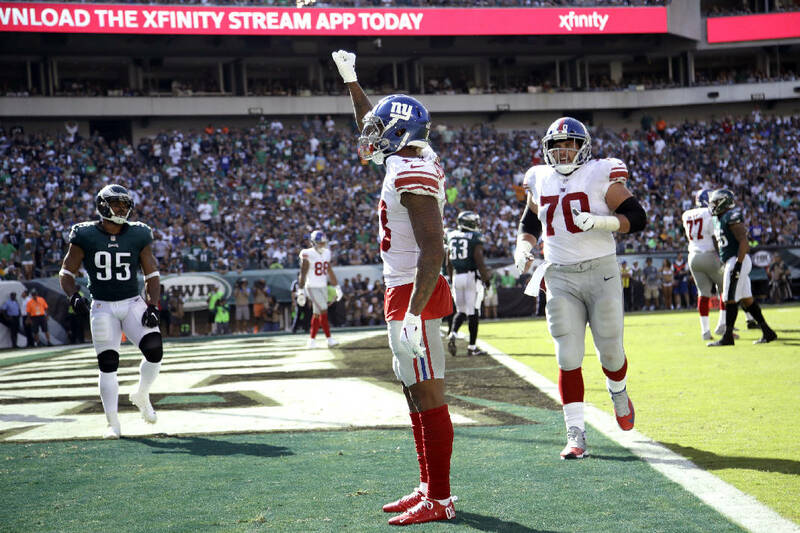 The Giants odds doubled from 40-to-1 to 80-to-1 and the Jets are at 60-to-1 after opening at 100-to-1. Back to the Big Apple, the Giants are crumbling. Across town, the Jets are doing exactly what a team with a quarterback they believe in on a rookie contract. They added arguably the best free agent linebacker in C.J. Mosely and now they have add Bell, a dynamic play-maker who sat out last year but averaged 129 yards per game in his NFL career. In truth, there is so much NFL news swirling as we wait for the 4 p.m. that we almost forgot that today is Kyler Murray's Pro Day in Norman, Okla. Giddy up. 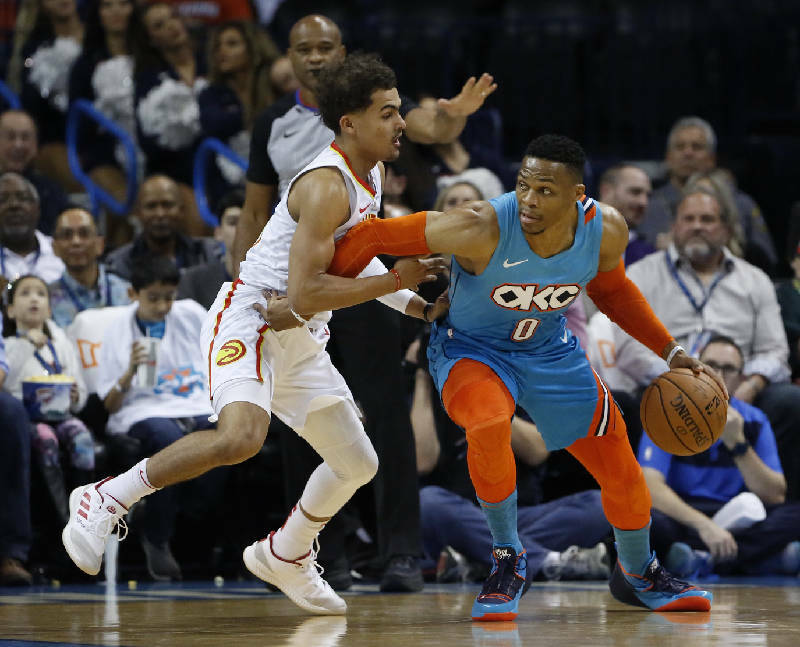 Oklahoma City Thunder star Russell Westbrook dribbles while guarded by Atlanta Hawks rookie Trae Young during Friday night's game in Oklahoma City. I don't care whose name is on the letter head, the answer is the star players. Period. Before we start, by all accounts Shane Keisel, the Utah fan who provoked Russell Westbrook, is not someone you want watching your kids. Before it was deleted, his Twitter feed was dotted with some nasty stuff, including at least one N-bomb Tweet. So dude is hardly a sympathetic case. But for Russell Westbrook — who treated to 'bleep up' a female and doubled down on it after the game — to get a $25,000 fine and Keisel to be banned from the arena for life is ridiculous. Westbrook's fine, when you factor in his $30.5 million salary — that's $371,951.22 per game and $7,748.98 per minute — amounts to roughly 4 minutes of work. If Serge Ibaka gets a three-game suspension for fighting another professional athlete in a game, how is that fine remotely close to fair? Certainly Kaiser is nothing close to the poster boy of someone you want to defend. But can anyone explain the balance of a guy who allegedly did not cuss — granted his history hardly paints picture of innocent heckler — getting a lifetime ban and the guy who threatened, nay, promised to hurt a woman gets four minutes of his salary docked? Anyone got an explanation on that? Or how the players can act like spoiled babies — have you watched them plead to the referees — but they are going to police the stands with a fine-toothed comb because of a rabbit-eared superstar? This comes within the same week that Knicks owner James Dolan banished a Knicks fan from the Garden for life for telling Dolan to "Sell the team." Seriously. You know what, NBA? Take your super thin-skinned bunch of millionaires and billionaires and hold hands and sing sensitivity training hymns. I'm taking a break — an extended break — from the NBA and here's betting I won't miss it all that much. Yes, when we think of college sports corruption, SMU getting the death penalty, the checkered history of Miami, the college basketball corruption and the all-time hush-hush, wink-wink that surrounds all of it. Who knew that USC crew was the Al Capone of the college sports realm? Former Full House star Lori Loughlin — forever known as Aunt Becky on the campy ABC hit that was the springboard for the Olsen twins, and yes, 'Aunt Becky' was trending on Twitter for most of Tuesday — and her husband paid $500,000 in bribes to have their daughters designated as recruits to the USC crew team to help get them into the school. Well, first, you have to be relieved that the country is so safe and so crime-free that the FBI has the time and resources to crack down on Wake Forest volleyball. That's excellent news. On a serious note, the accusations and allegations that there was rampant cheating on the college admission exams certainly warrant investigations and, if true, there must be ramifications. But, in some ways, does this surprise anyone? Rich people paving the way for their less-than-talented tots with cash? Really? When did that start? And, if Laughlin or Huffman or any of the folks with more dollars than sense, had made that $500,000 donation to the USC school of business for text books or a new wing on the admissions office, that's not called a bribe. That's called a donation. And, here's betting if Aunt Becky had made the Trojans an offer they couldn't refuse, then little niece Becky Loughlin would be enrolled on the up-and-up. The details of this are downright mind-bending. Several parents paid well more than the cost of tuition just to get their kids into the colleges. From the CNN story: "Two SAT/ACT administrators, an exam proctor, nine coaches at elite schools, a college administrator and 33 parents -- a total of 50 people -- are accused of participating in a scheme that involved cheating on standardized tests and bribing college coaches and others to admit students as athletes regardless of their abilities, prosecutors revealed in a federal indictment. The scandal is being called the largest college admissions scam ever prosecuted. "FBI Special Agent Joseph Bonavolonta said some parents spent anywhere from $200,000 to $6.5 million to guarantee admissions for their children. "The relatives of one applicant paid a California business owner $1.2 million to falsely describe the individual as the co-captain of a well-known California soccer team, although the applicant did not play competitive soccer, prosecutors said." Paying $1.2 million to say your kid played on a travel soccer team? Who has that kind of coin and if you have that much cash, just give that to lil' Johnny or Janie and call it a day. — Remember what I said yesterday about Gonzaga? Yeah, that. And please do not start with the "Loss is a good thing before the tournament," mumbo-jumbo. OVER-rated clap-clap, clap-clap-clap. — And yes, I picked the Zags to cover last night at minus-14 in the 60-47 loss, so I am doubly bitter. OVER-rated clap-clap, clap-clap-clap. — Side note on Le'Veon Bell deal: Yes, he will never get last year's money back, but avoiding injury allowed him to sign a four-year, $52.5 million contract with $35 million guaranteed. It's not as much per year as the $15 million salary he skipped out on last year, but more money long-term, which is important since at 27, this is his last monster deal. — This is eye-popping. Disney lost $100 million on online video projects in the first quarter of 2019 and, according to Bloomberg, is projecting to lose about $200 million more this quarter. Part of that is ESPN+, the digital streaming service. Yes, Disney is investing big bucks in Disney+, an online service to battle Netflix, but that's some serious red numbers. — The adage of spending money to make money certainly has proven true in recent offseason news. With the moves the Browns made and the moves the Phillies made, did you know that Cleveland — yes, a franchise that was 1-31 before last year — has sold out of season tickets for 2019 and the Phillies are arguably the hottest ticket in MLB. — Excited for the Players this weekend. Plus, conference hoops tournaments. OK, we'll go this way on a Which Way Wednesday. Which fan base should be more excited, Browns or Jets, with the news of Tuesday? Which fan base is more bitter, Giants or Steelers, with this offseason? Which punishment was more nonsensical, dude getting banned from Utah games for ever or Russell Westbrook being fined four minutes of work for threatening to "bleep up" a female fan? As for today, March 13, well, let's review. The Uncle Sam cartoon made it's debut on this day in 1852. Susan B. Anthony died on this day in 1906. Also, "The Searchers" debuted on this day in 1956. In honor of Spy's favorite movie, Rushmore of all-time westerns. Go.